InfoSAWIT, PALEMBANG – PT Pertamina Refinery Unit III did First Launching Environmental Fuel or Bahan Bakar Ramah Lingkungan Biosolar (B-20) in the Kilang RU III Plaju on Thursday (24/1). It is the commitment to run the policy of the government based on the Regulation of Minister of Energy and Mineral Resource No. 41 / 2018 to implement the usage of fuel mixture to diesel within fatty acid methyl ester (FAME) about 20% which is produced by Badan Usaha Bahan Bakar Nabati (BU BBN). “The launching of biodiesel (B-20) showed that PT Pertamina Refinery Unit III Plaju is ready to support the program of the government and to fulfill the security of supply, namely in the southern of Sumatera through the synergy with Marketing Operation Region II southern of Sumatera to produce and distribute environmental fuel to the people,” General Manager RU III Plaju, Yosua I. M Nababan recently said in the official statement to InfoSAWIT. RU III has improved both from the infrastructure facility of FAME acceptance and from B-20 production in a very short time. The factory of RU III could process the FAME stocks from the suppliers within the capacity 30.000-40.000 kiloliter (kl)/month. FAME is got from the ship and distributed through RPM (Rumah Pompa Minyak) Fuel in the tank storage to be blended with diesel as B-20 then it is lifted through the existing infrastructure both ship and pipeline to TBBM in South Sumatera and Lampung. “We thank and appreciate Minister of Energy and Natural Resource when visiting RU III. Making the clean energy is our priority as the first green refinery in Indonesia,” he said. The implementation of environmental fuel certainly influences the fuel imports and it is hoped that rupiah would be more stable and save the exchange. By advantaging palm oil, besides it could welfare the smallholders by stabilizing the CPO price, it could also reduce the green - house gas emission up to 29% from business as usual (BAU) in 2030. RU III Plaju is one of 30 locations to get FAME within the consideration of B-20 needs in South Sumatera and Lampung reaching 3.500 - 5.000 kl/day. Half of the needs could be regularly fulfilled by RU III Plaju that could supply biodiesel (B-20) up to 180.000-200.000 kl/month. 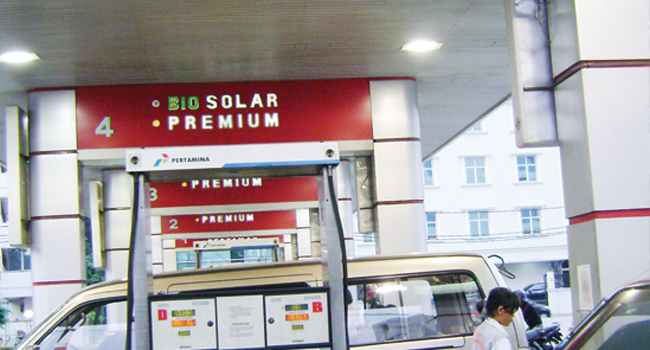 This is part of PT Pertamina to guarantee the stocks of environmental fuel in the markets.